Miss C. H. Hudson is an artist who has long intrigued me. Though rarely seen, her work has great charm and is painted with delicacy. 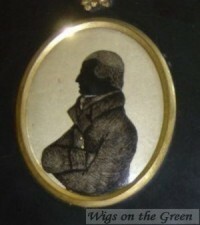 When British Silhouette Artists and their Work 1760-1860 was published, Sue McKechnie had only seen one example of a silhouette by C. H. Hudson and this dearth of information led her to suggest that the artist may be a son of the better-documented silhouette artist, Elizabeth Hudson (née Chilcot). 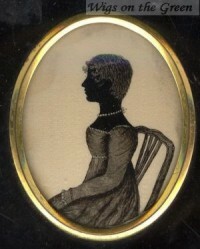 Mrs Hudson, born in Bath between 1750 and 1754, painted silhouettes between 1793 and the early 1800s. She specialized in bust-length profiles reverse-painted on convex glass backed with plaster. From the known examples of Miss Hudson’s work, we can deduce that she was painting profiles between 1810 and 1821. 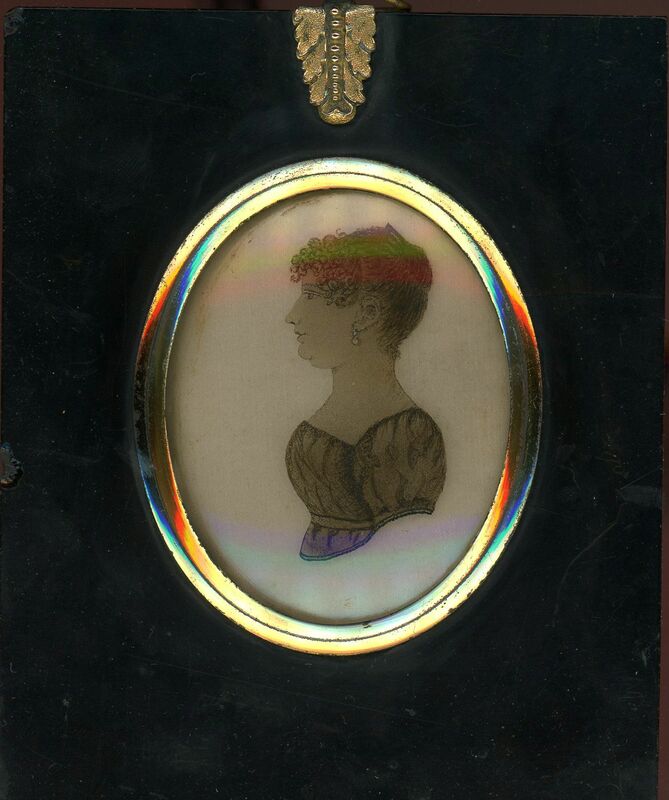 The earliest known silhouette, signed ‘Painted by / Miss Hudson / June 1810 / aged 15’, is of a young lady seated facing right and holding a book. 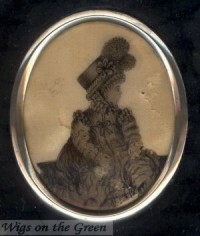 It was part of the Willcocks Collection sold by Phillips in 1998. In my own collection I have a silhouette by the same hand of possibly the same young lady facing left; it is signed ‘Painted / by / C. H. Hudson / Cirencester / Sept 1818’. This dispels the suggestion that the artist was male. 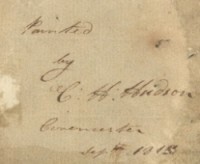 Miss C. H. Hudson was therefore born between June 1794 and June 1795. Without knowing her Christian names, it has not proved possible to trace her genealogy. If she were a daughter of Elizabeth Hudson, this would put her mother’s age between forty and forty-five at the time of her birth. Not impossible, even in the eighteenth century. Elizabeth got married in October 1777 so we can assume that her eldest son would have been born in 1778 at the earliest. If he were the father of C. H. Hudson (making her a grand-daughter of Elizabeth Hudson) he would only have been seventeen when she was born. That seems less likely so, if the two artists are directly related, it seems most probable that C. H. was a late daughter of Elizabeth Hudson. 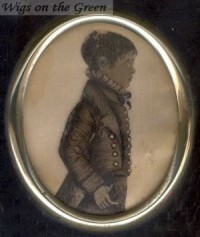 Miss Hudson’s profiles are reverse painted on slightly convex glass using a stippled base within an outlined edge with darker linework and cross-hatching. Gold is only used for buttons as demonstrated on the profile of the little boy with his thumb in his pocket. 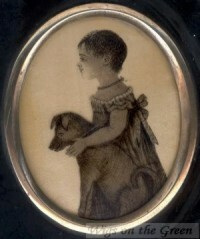 Her finest work is without doubt to be seen in her profiles of children which are well modelled and have good detail. The silhouettes are invariably backed with cream satin stitched over card and set in papier-mâché frames. They are signed on the backing paper. If she was the daughter of Elizabeth Hudson, she would have watched her working and may even have been given some lessons. Given how very few examples there are of her work, it is fair to assume that Miss Hudson only painted profiles of her family and friends for her own pleasure and did not paint commercially.